The heel bone is the largest of the 26 major bones in the human foot. 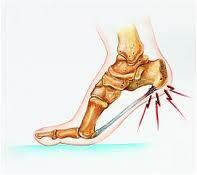 But while it is a large, strong bone, it is often injured and this pain can be quite disabling at times. Heel pain is most often caused by plantar fasciitis -- a condition that is sometimes also called heel spur syndrome when a spur is present. Heel pain may also be due to other causes, such as a stress fracture, tendonitis, arthritis, nerve irritation, or, rarely, a cyst. Have your questions about Heel Pain answered by Dr. Michael Horowitz by calling 604-737-3668 or by filling out the form below. He will respond promptly.